I want to thank you so much for putting together what was the Best Fly Fishing Trip Ever for me! Your Pacific Blue Marlin Fly Fishing School was a truly eye opening experience for me. From being picked up at the San Jose airport to the great accommodations at Los Suenos, the great charter boat we fished from for three great days of world class blue water fly fishing, the fabulous, friendly, highly skilled boat crew and captain, to your incredibly in-depth knowledge of the fishery, gear and tactics. I learned so much about true big game fly fishing. Fly fishing for Pacific Blue Marlin proved to be the most challenging / demanding fly fishing I have ever experienced. 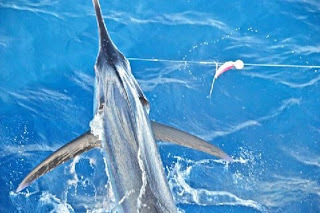 The Marlin are smashing the fly just thirty feet or less from where I was standing at the back of the boat. 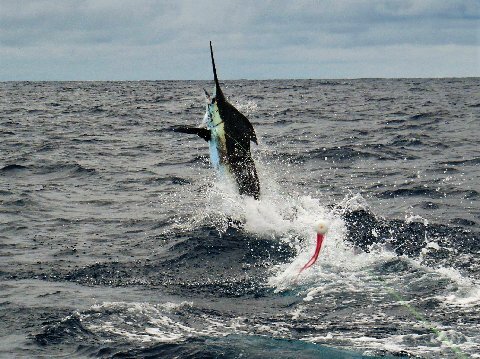 The Marlin strike is the most jaw dropping experience I have ever witnessed in fly fishing. Very exciting. The power of these magnificent fish is really something to behold, up close and personal. 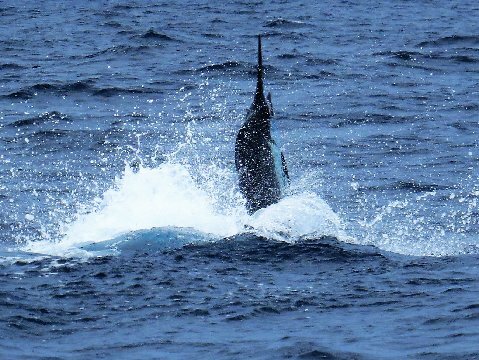 In the three day trip we had 48 Blue Marlin come in to the teaser pattern. We hooked up to 13 of those Marlin and landed and released 5 of those Marlin. 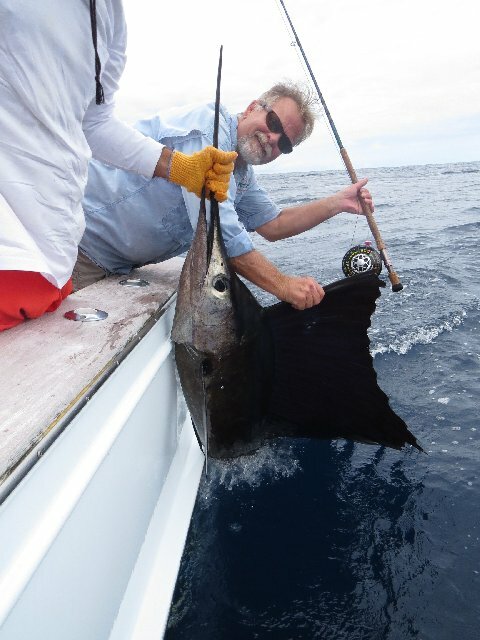 We also landed and released the one Sailfish that came around. It can be done. 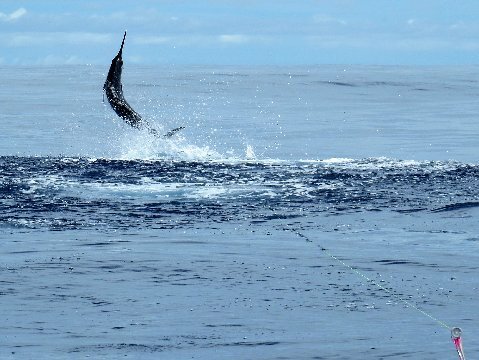 You too can catch a Pacific Blue Marlin on fly and 20 lb class tippet. I would definitely call this a trip of a life time except that now that I have done it once, I need to do it again. Very exciting, very challenging trip. Thank you Jake. Best fly fishing trip ever! August, 6, 2017: Today my friend David Taylor ( owner of Alaska, "Reel Wilderness Adventures" in the Bristol Bay region) arrived here in Los Suenos Costa Rica, after a safe trip from his home in Washington state. Gary is here to catch his first Blue Marlin on Fly, on 20 pound test IGFA class tippet. David and I have been friends since the 1990's and he has been planning this trip for many years. He is a fly fisherman but has never caught a Billfish on fly. Now I have been really sick with what started as a cold virus that turned into a sinus infection, then to a upper repertory infection and then to bronchitis. A couple days ago my blood pressure was very high and I needed rest and medical care which I received here in CR. 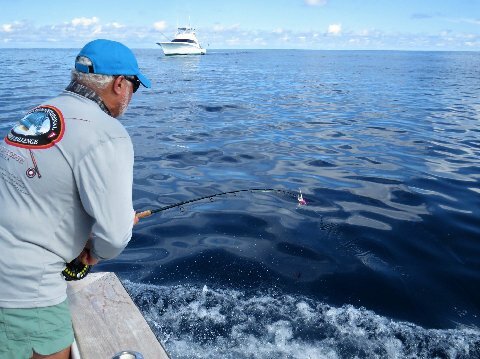 I gave David a 4 hour course in everything I know about catching Billfish on Fly, and pre paired him for what was going to happen on his trip. August 7, 2017, spent most of the day being treated at the medical facility then took David down to the marina, at about 3:00 PM. Captain James Smith with mates Berto and Roberto had the "Dragin Fly" running and ready to go, they headed out and I went home to bed. They ran through choppy weather and some rain, went to sleep at 8:00 pm to rest for first day of "The Costa Rica Blue Marlin Fly Fishing School". August 8, 2017 After breakfast and coffee, the teasers were deployed at 5:15 AM, and the first Blue Marlin raised was at 6:28 am, it did not bite. After a couple of raise fish and one big fish fought for over 1 hour, then broke off, then at 8:00, a 250 + pound blue marlin pounced on my CS. pink and white tube fly, and was off to the races. David remembered his instruction and with my TFO Blue Water Heavy Duty Fly-Rod, and #9700 B Mako Fly-Reel, rigged with RIO Leviathan Fly Line, with 20 pound test IGFA class tippet, caught and released his first Blue Marlin, (first billfish) ever, it took 1 hour and five minutes. Congratulations to David and my awesome crew aboard "Dragin Fly". At 9:21 am David Taylor made a cast to another hot blue marlin, another big, (over 200 pound) marlin. This fish was tough and fought hard for close to an hour, "I wanted to quit but could not give up" "I was exhausted, every part of my body hurt" said David, "then I remembered your instructions; take a deep breath, then loosen your grip, totally relax" with his second wind David caught and released his second Blue Marlin on fly of his lifetime! After that they raised a bunch of fish several over 400 pounds, Dave missed a few and was really tired, he asked Berto if he would catch one to help him see what was happening while the fish was hooked up. The next Blue Marlin to come up looked to be about 200 pounds, Berto made the cast and hooked this awesome fish. Twenty minutes later Berto caught and released this magnificent Blue marlin on fly. The fish were hick but stopped biting around 3 pm, David broke off a hot blue at 5:10 pm, then they deployed the sea anchor and celebrated catching three blue Marlin on fly on the first day out. The score after a day of "The Costa Rica Blue Marlin Fly-Fishing School" was 19 Blue Marlin raised, 8 Blue Marlin bites, with 3 Blue Marlin caught and released. August 9, 2017: Team awoke at 5:00 am and pulled the seaanchor then while eating sausage with eggs and fresh Costa Rican coffee, the teasers were deployed. David's comment "I feel old" he said when describing this trip, raised several marlin before 7:30 but none stayed on the line. 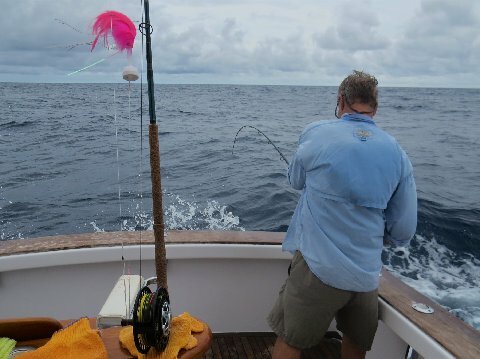 Then at 7:45 David Taylor (Fly Angler) made a good cast, then he hooked a 270 pound Blue Marlin. About 55 minutes later David caught the fourth blue marlin of the trip, "WOW" was his comment. 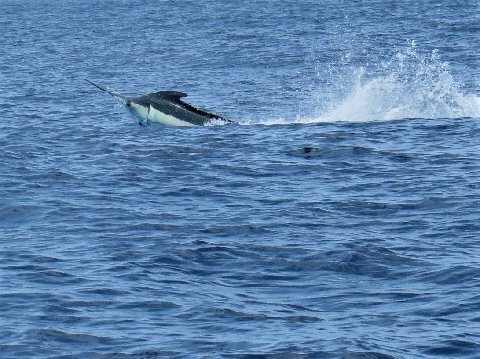 At 8:55 am David hooked a 400 + pound blue marlin on 20 pound IGFA class tippet, that fish never stopped jumping and when it was 300 yards away the fish turned on the power and the tippet broke while the fish was in mid air, "Holy Sh**, did you see that?" "WOW"!!! The weather is beautiful and calm today, around 10:25 David hooked and fought a 300+ pound blue marlin, and within 40 minutes he wound the leader through the tip top, and caught the fifth Blue Marlin of the trip. several more raised fish then at 5:40 pm David was fighting a 400 pound Blue Marlin when the hook came out, Dave said " Enough for today, I am done". They quit fishing and deployed the sea anchor, had a great dinner and went to sleep. The score fro today was 20 Blue Marlin Raised, 5 Blue Marlin bites, 2 Blue Marlin caught and released on 20 pound IGFA class tippet, "Lots of big Marlin around! August 10, 2017: Woke up at 5:00 am, started fishing at 5:30 am but fishing was slow, pretty choppy at the FAD. 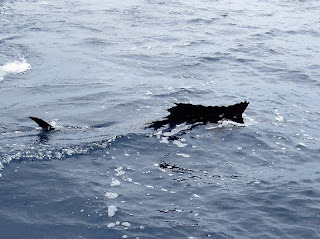 Raised a couple of marlin but they were shy and would not tease in for a bite, David said he wanted to catch his first Sailfish in fly so after a couple of hours James headed inshore to look for a sailfish for David. 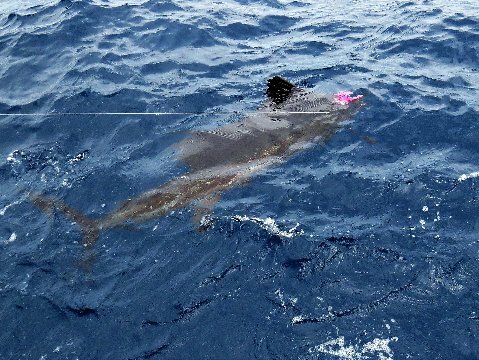 At about noon, David hooked his first ever Sailfish on fly, and 20 minutes later he released that 90 pound sailfish. 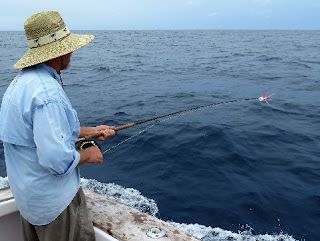 Now James was looking for Striped or Black Marlin for Dave, after raising a couple of finicky marlin which would not bite, they chose to try to get back to Los Suenos marina close to dark. At 6:00 the Dragin Fly arrived back at the marina at Los Suenos, I was at the dock to congratulate David and the crew for another awesome "Costa Rica Blue Marlin Fly Fishing School" . Today's score was 5 Blue Marlin and 1 Sailfish Raised, 1 Sailfish Bite, and 1 Sailfish caught and released on 20 pound test IGFA class tippet on the fly. August 11, 2017: Typing this report, still at 80 percent health wise, blood pressure 120 over 80, breathing good, still have nagging cough, great medical care her at Los Suenos resort in Costa Rica. 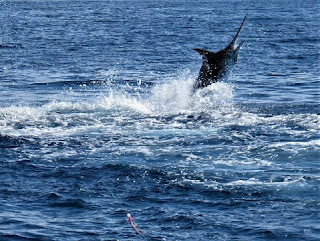 The final score for this (short 2 1/2 day) "Costa Rica Blue Marlin Fly Fishing School" was; 44 Blue Marlin and 1 Sailfish raised, 13 Blue Marlin and 1 Sailfish bites, 5 Blue Marlin and 1 Sailfish caught and released, all on 20 pound test IGFA class tippet on the fly. Stay tuned for more reports from my Costa Rica Blue Marlin Fly Fishing Schools. I Love my job, wish you were here. #tforods #makoreels #BFF. July 30, 2017: Yesterday my friend Gary Caputi arrived her in Los Suenos Costa Rica, after a safe trip from his home in New Jersey. Gary is here to catch his first Blue Marlin on Fly on 20 pound test IGFA class tippet. While here he is doing photography for an article he is writing for a major angling magazine about the latest techniques for catching Blue Marlin on fly. After an in depth interview, we had a great dinner at the in “Marina Village” then after I soaked my back in my Jacuzzi (Hot Tub) I went to bed. July 31, 2016: Took a swim and sat in Jacuzzi early in the morning, then cooked breakfast and packed for the trip, After lunch we got ready and at 2:30 headed down to the marina where Captain James Smith with Mates Berto and Roberto had “The Dragin Fly” provisioned, running and ready to head offshore. 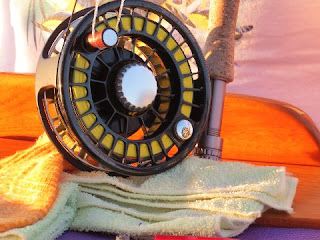 At 3:00 we left the dock at Los Suenos and headed out and at 3:30 we slowed to a troll and deployed our teasers, while I got my TFO Fly Rods, Mako Fly Reels, with RIO fly lines, and Cam Sigler tube flies ready to cast. Partly cloudy with 2 to 3 foot chop relatively calm seas greeted us. We raised no fish and at 6:15 it got too dark to see so we quit for the day. Dinner was prepared by James’ wife and it was home-made meat sauce and Roberto cooked the linguini, then he served us ice cream for dessert, we were asleep at 8:00 at night. August 1, 2017: We awoke before 5:00 AM to the smell of fresh brewed Costa Rican coffee along with eggs and bacon cooking. We arrived at Blue Marlin Destination X #6 (BM-X-#6) at 5:15 am with teasers deployed. At 7:10 am we raised our first blue marlin, a lit up 125 pound fish which came up on the long rigger. Wanda was ready, she picked up the TFO Blue-Water HD fly rod, made a perfect cast with the JJ pink and white popper fly, and hooked that marlin. 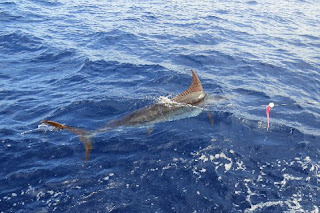 Now you know, that this is Wanda’s first marlin ever, now she is fighting it like a pro, while using 20 pound IGFA class tippet. After a 26 minute battle where that marlin jumped at least 30 times, Wanda wound the leader inside of the rod tip and caught her first of many to come Blue Marlin on fly. Berto got the fly back out of that marlins mouth and released the awesome fish at 7:45 to grow and be caught again. Congratulations to Wanda “Blue Marlin on fly” Taylor. We raised 2 more fish that did not eat and then at 8:20 I hooked a big blue marlin of over 250 pounds, which was a really tough fish. This marlin ran and jumped a lot, before sounding and giving me a 30 minute tug of war, just guessing this fish may have jumped several dozen times before we backed down to within 3 foot of getting the leader for a release. As I stretched out to get the leader the big blue marlin, jumped and broke the 20 pound class tippet, we got the fly back and then that awesome fish was gone. At 10:28 Gary decided to go down below to use the head, just then a 300 + pound blue marlin ate my well placed fly, was still hurting from that last fish, but this fish was much bigger. After a 25 minute battle and my exhaustion I made a mistake, that marlin jumped and at 11:01 the class tippet broke when the fish was 10 foot from the boat. Awesome marlin, I am really weak and tired. 11:05 AM when Gary hooked a 150 pound blue marlin which ran around jumped a lot then spit the fly and hook back at us at 11:12 AM. Then at 11:15 Wanda hooked another blue marlin that ran out 200 yards and broke the tippet. At 12:40 Gary hooked a hot 175 pound blue marlin, after several shots at that fish, it went deep and stayed down for 45 minutes and then at 1:50 the hooks pulled and we got the fly back. At 2:15 we raised a hot marlin, Wanda made a good cast but that marlin would not eat her fly. Since 9:30 am the seas and wind laid down to dead calm, with sun shine and very hot weather, what a beautiful day with lots of marlin around. 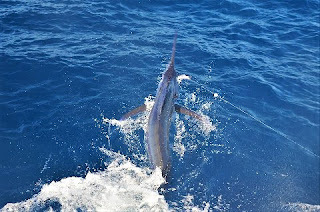 Between 2:30 and 4:00 pm we raised 5 more marlin; they would come close but not eat the fly. As it gets dark today at 6:30 we pulled in our teasers and deployed the sea anchor. Dinner was served at 7:00 PM which was Salad, Beans and rice along with a coconut chicken which was really good. Everyone is tired and ready for a night sleep as we discussed the awesome day of fly fishing for blue marlin which we just had. Today we raised 19 blue marlin; got 7 to bite our flies and Wanda Hair Taylor caught and released her first Blue Marlin on Fly. 8:00 PM everyone on boat is asleep except lookout. August 2, 2017: 5:00 AM we pulled the sea anchor and deployed the teasers. While we were eating breakfast a 150 pound red hot Blue Marlin came charging in on the flat line, I ran outside made the cast, and that marlin gobbled my fly. So as the sun came up at 5:26 I was fighting the first fish of the day, at 5:41 we released that marlin and recovered the fly from my awesome marlin, (my 55th lifetime blue marlin on fly). At 5:54 am TFOs Wanda Hair Taylor cast to a hot Blue Marlin, the fish jumped all over her fly and then ran out 200 yards, shook its head, and broke the 20 pound tippet. Two Blue marlin bites before 6:00 AM, sunny, calm, and hot. Next Gary Caputi pulled the hooks on a 130 pound Blue marlin at 6:25. 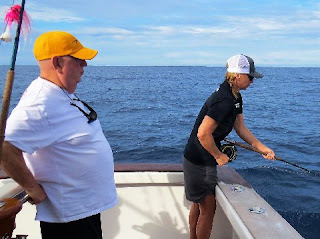 Wanda fought a sailfish and broke it off with the line around the handle, and then at 7:20 Gary hooked and fought another nice blue which went deep and broke the tippet. At 7:30 Wanda missed a sailfish, and then during the next half hour we raised 4 more marlin which didn’t eat. At 8:15 am my fluffy blond friend Wanda Hair Taylor, our TFO super star, made a perfect cast to a big Blue Marlin (250 to 300 pounds). That big fish ate Wanda’s pink and white tube fly and the battle was on. The smooth drag on the Mako reel fed off a couple hundred yards of backing as that great fish jumped several dozen times, Wanda leaned hard on that TFO Blue-Water HD Fly Rod and turned that fish that weighted twice what Wanda weighs. After a 22 minute battle where both the fish and the angler were tired, Wanda wound the leader through the tip top of the fly reel and caught a Pacific Blue Marlin which was almost three times the size of the 90 pound current ladies world record IGFA 20pound tippet class. During the next 40 minutes we raised a bunch more marlin, Gary Caputi having some bad luck hooked and fought 3 in a row, broke 2 off on the jump and pulled the hook on one. At 9:30 we raised five at one time, but none ate the fly. Then a 9:45 Gary broke off another one, a fish of over 300 pounds. Next at 10:01 I hooked a big blue that ran out several hundred yards then after 9 consecutive jumps the 20 pound tippet broke. So between 5:15 am and 10:00 AM we have raised 17 blue marlin, nine of them ate the fly, of which we caught two Blue Marlin on fly in the first 5 hours of our 13 hour day. At 10:15 Gary hooked a 250 pound blue marlin, he had it on for 7 minutes that fish went really deep and broke off. At 10:25 we raised a blue marlin that did not eat. 20 blue marlin and 2 sailfish raised in 5 hours. I lost track but we missed a few more, I fought a fish for ½ hour that broke off with 300 yards of backing going straight down. As of 1:30 today we have raised 26 awesome Blue marlin and 3 sailfish, we have had 11 bites and we caught 2 Blue Marlin on fly. 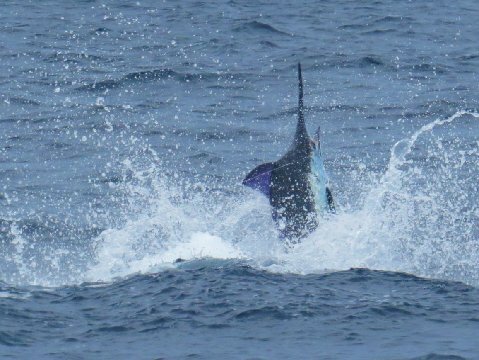 These big blue marlin today are very aggressive and eat the fly really good that said they may be the toughest and meanest marlin that I have ever fly fished for. Only 5 hours of fly fishing for blue marlin left today. At 2:04 Gary Caputi made a great cast and hooked a nice 150 pound Blue Marlin, this was an awesome fighting fish that never jumped until 2:41, and then five minutes later Gary caught that (his first) Blue Marlin on fly. 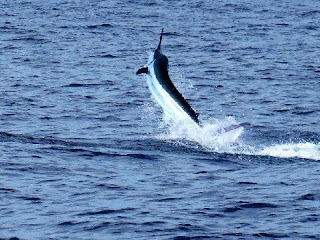 Fishing has slowed down late in the afternoon on this sunny calm day, as of 6:00 pm right at sunset, we have raised 29 blue marlin and 3 sailfish today, we had 13 Blue Marlin and 3 sailfish eat our flies, and caught 3 Blue Marlin on 20 pound IGFA class tippet on the fly. This was one of the most exciting days of fly fishing for these awesome fish which I have had in my career. Dinner is cooking while we are showering, WOW! Sound asleep by 7:30 tonight. August 3, 2017: We awoke before 5:00 am well rested and ready to catch some Blue Marlin on fly. The crew pulled the sea anchor and then deployed the teasers as I got the fly tackle ready for another day of catching Blue Marlin on fly. Roberto served breakfast and coffee as we trolled back toward BM-X-#6 to look for Blue Marlin. The sausage, eggs, and toast with fresh brewed coffee was great, however at 5:40 we raised our first blue marlin, did not eat Wanda’s fly. We raised two more at 6:05 and 6:31 am they lost interest and did not eat the fly. At 6:49 Wanda hooked a 200 pound blue marlin, she fought it for 7 minutes and after 13 humps she got to within 40 foot of that marlin. 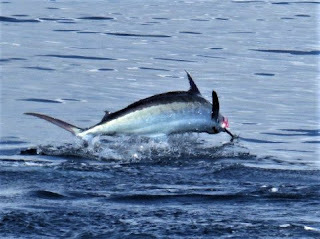 After that the marlin took off in high gear jumped and broke the 20 pound IGFA class tippet (Gone). Raised another blue at 6:58 did not eat. At 7:15 Gary Caputi hooked a 270 pound blue marlin, this fish put on an exciting jumping show, all on video, after 42 minutes we released our fifth Blue marlin of the trip and our first of the day and Gary’s second in his lifetime. At 8:21 I cast to a hot Blue Marlin that came in fast on the long teaser, the fish gobbled my Cam Sigler big marlin tube fly and was off to the races. We got some great video and photos of this 175 pound beauty, and then 17 minutes later I wound that fish on and got the leader. Roberto leadered the marlin for pictures and got 9 more jumps while holding the leader, after which he got the fly back and released our sixth Blue Marlin of the trip at 8:46 am. Fishing slowed and by 10:00 am we had not raised a marlin in over an hour, Gary was not feeling well, while I am recovering from a bad cold, We are 130 miles from the marina so I suggested to James that we should cut the trip short, check out several other areas where there are sea mounts and FADS on the way in to Los Suenos. So we trolled slowly toward some inshore locations where there may be some marlin looking for flies. At 12:44 after eating a couple of Yellow-Fin tuna tacos, we raised a 90 pound sailfish, I made a decent cast and then three minutes later I caught and released that awesome sailfish. Shortly later Captain James put the boat on a plane and headed to the dock, we arrived at Los Suenos at 6:00 PM this evening. Today we raised 12 Blue Marlin and 3 sailfish during the first 5 hours of fly-fishing, we got 3 Blue Marlin and 2 sailfish to bite the fly, our total for the short day we caught and released 2 Blue Marlin and a sailfish. During this short two and a half day Blue Marlin Fly-Fishing School trip aboard the vessel “Dragin Fly” our total score was 58 Blue Marlin and six Sailfish raised, 23 Blue Marlin and four Sailfish bit our flies, as a team we caught and released six Blue Marlin and a Sailfish in 2 ½ days of fly fishing while using 20 pound test IGFA class tippet. Our percentage was that we caught and released was 25 percent of the blue marlin that ate our flies. 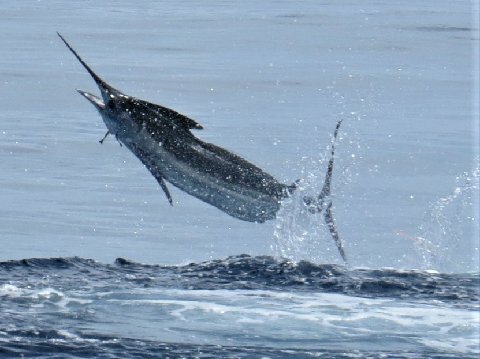 Thanks to George and Anna Beckwith (owners of “Dragin Fly” and “Down East Guide Service”) and my awesome partners in this venture where we take anglers and teach them successfully how to catch the APEX predator (BLUE MARLIN) on IGFA Class fly fishing tackle by using 20 pound or lighter breaking strength line. Also my thanks to Captain James Smith, along with mates Berto and Roberto, are in my opinion one of the best fly fishing big game, charter fishing, crews in the world. Thanks to my pal Gary Caputi for making this trip to photograph and document this trip while also catching his first and second Blue Marlin on fly in his lifetime. My friend Wanda Hair Taylor, who had dreamed about catching one of these Awesome Blur Marlin on Fly using all IGFA rules and tackle, “You Did It Girl” Congratulations on catching two awesome Big Blue Marlin on Fly! Another Costa Rica Blue Marlin Fly Fishing Schools is now over, I love my Job, wish you were here. Stay tuned as we head back out on Monday for another of my schools. #tforods, #Makoreels, #BFF.